JEFFREY: So Lee Child comes and asks if you would like to write a Jack Reacher-related novel. That's literally an offer you can't refuse. DIANE: I blame idle hands, red wine and cocktail parties. Lee and I were in New York City at an author event a few years ago not long after we'd both rotated off the board of International Thriller Writers. We'd worked together before and both of us had a little break in our schedules. He suggested we should write something together. Something short, quick, easy. Sounded like fun to me. So we talked about it for a while, off and on, in the following months and eventually I came up with the concept for a series of stories that used Lee's Reacher books as source material and jumped off from there. He loved the idea. And the rest, as they say, is history. I've now written two novels and three shorter books featuring FBI Special Agents Kim Otto and Carlos Gaspar on the Hunt for Reacher. Jack in the Green will be released on May 1 and a fourth novel is in the works and should be released later this year. 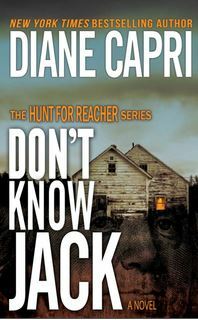 JEFFREY: Many authors would have made you ghostwrite this … or set it up so that they got the big type on the cover and "with Diane Capri" in tiny print underneath. Lee didn't do that. DIANE: I'd be thrilled to co-author with Lee Child in almost any capacity and we had hoped that might happen. So far, the scheduling hasn't worked out, given Lee's insanely busy life. But in the case of my Hunt for Reacher series, while Lee is a great friend and he has been exceptionally supportive and generous with me, we're not trying to pass my books off as his work. How could we? He has a style that is all his own. Millions of us love his work and his popularity is growing. He's an original that can't possibly be duplicated. I, for one, am hoping Lee Child will be writing Jack Reacher for decades to come. Aren't you? JEFFREY: I can only imagine the pressure that came writing the first novel, especially with the decision not to adopt Child's writing style for the series. How did you put that out of your mind so you could focus on writing? DIANE: As much as I'd like to claim that I made a choice not to write like Lee, the truth is that no one can write like Lee. Honestly, I've never tried to imitate him because the effort would be futile. If I'd begun this project with that goal in mind, I'd have failed before the first book was completed. All I can do is write like me. There were many tense moments when I worried that Reacher fans would hate my work. Fortunately, readers like my style and enjoy my books, too. Whew! JEFFREY: Is there a Jack Reacher encyclopedia that Child gave you, or did you have to create that yourself in order to stay as accurate as possible? How do you handle the continuity issues? DIANE: Staying true to the Reacher canon is hugely important. I'm very lucky to have three secret weapons to help me. First, I'm a huge Reacher fan myself. Always have been. I take copious notes, have all sorts of charts and outlines, and I have a good memory for the things that are important to my series. Second, Reacher's Creatures. These folks are incredibly knowledgeable and helpful. Third, I go right to the source. After all, who knows Reacher better than his creator? You can learn more about Diane Capri at her website. Her latest Hunt for Reacher book, Jack in the Green, is out now.